I recently went through a smear campaign from someone I’ve never actually met! The person kept copying my posts word for word, and I rightfully reported it. They were trying to make money off of my work, (and that of many others.) They’d copy our work word for word, put their name on it, then ask for donations for their time. That was pretty stunning, but also pretty typical for a narcissist. Can you imagine copying someone’s work directly and trying to make money on it? I can’t…. I’m not even asking for donations for my own work, so I certainly don’t want a narcissist making money off of the things I spend time writing! What they were doing was a copyright violation, and the posts were legally removed, so they tried to be sneaky and copied the same things…but changed a few words. That too, is still plagiarism. I was stunned that someone would copy everything I spent time doing so that they could be so tacky as to ask people to PAY them for “helping.” Very nervy, but typical of an entitled narc. It got worse, though. When the person got in trouble for doing it so often, she went into a severe narcissist rampage. Even though she’d been making money off of many of us for months, (and by the way, you won’t see me ask for donations. I would be horrified to do that!) she started an extreme smear campaign against me saying I was being mean to her for no reason. Of course the narcissist never tells the real, story right? She posted repeated defamation and slander against me all over social media. She sent emails to people who “liked” my posts to smear me. It was classic smear campaign, and it was all the more insane because she had been literally stealing from me and making a living off my work and the work of others, then raged because I didn’t want her to use me, (and scam others,) anymore. Multiple times, she mocked me because I’m not making a bunch of money from my page. (How strange, but of course, it shows her real goal is to make money off victims.) I just defended myself a couple times without naming names or sending flying monkeys. In typical narc fashion, when this person was smearing me publicly and telling lies about me, she 1. totally omitted the reality that she had done something crappy to me, and 2. she minimized the situation. She kept saying that she had similar ideas, when in reality, she’d copied my posts word for word. One thing I’ve always done with narcissists is, I tell my story, but I don’t name names. Oh I’d loooove to post my sociopath ex’s name all over, but that would be unethical. Even though I’d be telling the truth, I’d be putting myself in a very bad place to publicly name my abuser or any other narcissist I’ve dealt with. It’s wiser not to do that. Share the stories so others can see for themselves, because if you see a public smearing, you are most likely seeing the narcissist in action trying to destroy the target. That’s what narcs do. They use and misuse you, then play victim and trash you with lies when you want it to stop. The “forget” to tell what they did wrong, or they mis-characterize it to fudge or minimize what they really did. They want to make themselves bigger off the back of others because they feel so entitled. Then they badmouth and smear the very people they’ve been using. This person used social media to gather a group of flying monkeys and encouraged them to send me bullying messages or harass me. This is a KEY sign of a smear campaign…when you contact others to smear the target or you encourage others to bully them. It’s one way to know you are being used as a flying monkey. The situation goes beyond education and into an outright, overt, public smear campaign with the narc gathering others to help. It’s usually the person who isn’t naming names or sending teams of monkeys who is the target. 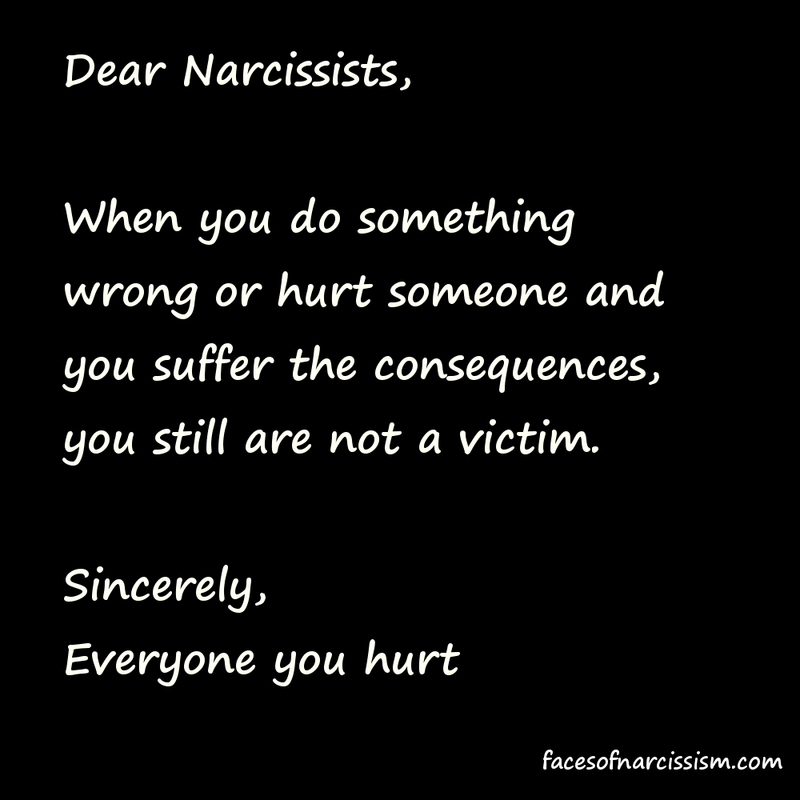 And unfortunately, it’s usually the narcissist who gathers the followers when they target others. 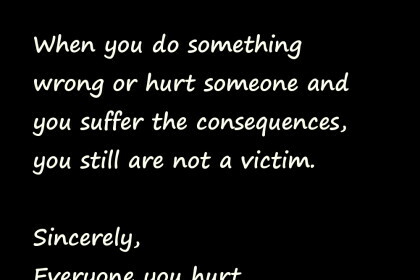 Since the incident, I have ignored the person. It does no use to check to see if a narc is still trashing you. I know they still are, because I get messages about it, but as far as I’m concerned, if they are still smearing my name, it speaks more of them. All we can do is be honest and keep having integrity. The narc will move on to the next person.